This was one of the last shots of the night. 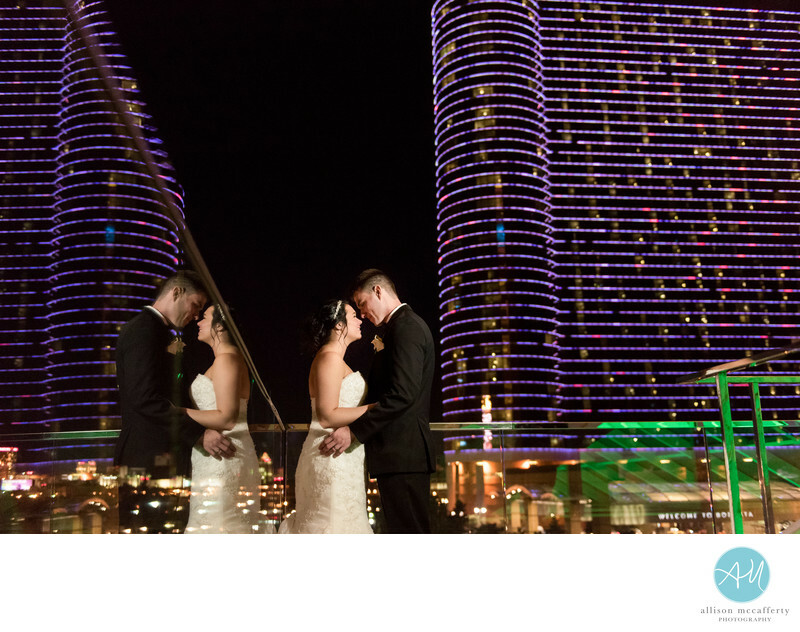 We took the bride and groom out onto the balcony of the Water Club that overlooks the Borgata Hotel tower. I asked my assistant to hold a light to illuminate the bride and groom and I crouched low to get their reflection on the glass. I just love it. Their wedding was all about the glitz and glamour and this portrait just screams drama! If you are looking for a one of a kind wedding venue at the Jersey Shore, Borgata's Water Club in Atlantic City, NJ is an amazing location. It is close to the beaches of Brigantine and a short drive to the boardwalk in Ocean City, NJ. Wedding portraits on the beach are one of my favorites to do. There's just something about walking on the sand and the ocean breeze that just screams romance. Other Jersey Shore wedding venues include Mallard Island Yacht Club in Manahawkin, Bonnet Island Estate in Manahawkin, The Grand Hotel in Cape May, Congress Hall in Cape May and One Atlantic in Atlantic City NJ just to name a few. The Pool at Borgata Water Club makes for a unique wedding venue choice. You feel like you are dancing on water since they cover the pool with a clear plexiglass. The ceiling is glass and the room is filled with huge tropical palm trees. It is definitely a romantic place to have your wedding reception. Location: The Water Club Hotel at Borgata, .